5 out of 5 stars Deliciously Wicked! 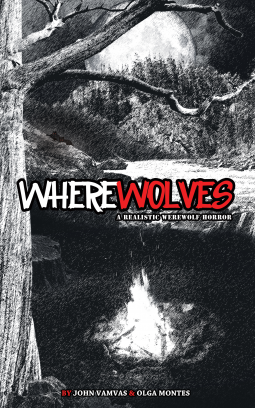 Freakin Fridays #33 ~ Wherewolves by John Vamvas and Olga Montes ~ Bring on the movie! I’m a huge fan of B- movies and this reads like a good one. As I read each scene I easily and gleefully visualized it, every bloody bit of it. A group of troubled teens are taken into the woods for a survival weekend. The teacher leaves them to fend for themselves. I know. Seen ir or read it before…. you think. The author brings a lot to the table, introducing you to the characters which consist of the typical jocks, bullies, and geeks. You get to know what drives them, what scares them, before they even enter the woods that night. As dark approaches, they huddle around the campfire telling stories. It might not be a cozy gathering, but things aren’t too bad. Until they sense something watching them. This is where the story gets gritty. I love character driven novels and how, when a group is faced with a life or death situation, the dynamics come into play. It takes just a few hours for the fight or flight instincts to consume the teens and chaos to reign once some of the group go missing. The screaming and snarling from the deep dark of the woods scatters the group and they fear each other as much as what’s stalking them. The authors brought it all to the table, the fear of the dark, the peer pressure, the teen angst, and the will to survive. This book may have teen characters, but I don’t think there’s much difference between how they acted and a group of adults would act. If you’ve watched Stephen King’s The Mist, you can see how quickly adults succumb to their own fears. In fact, I think the teens might be better prepared for something like this. They aren’t that far from when they feared the bogey man under the bed and may be quicker to believe the unimaginable. From the title you get a clue to what’s stalking these teens. Feral beasts from your nightmares. These aren’t shifters. They don’t turn into humans and they are horrific in their maniacal glee as they rampage through the group. I knew what was waiting out in the woods, I knew not everyone would survive, and I knew some would turn on each other and that filled me with trepidation, built the tension to a fever pitch, and had me jumping when my dog suddenly barked at something outside. His own special effects to set the mood for me. I just love a good werewolf book without the shifter glamour and romance. It was a bloody frolic right to the deliciously wicked ending.